Long before Dale Earnhardt Jr. Jr. changed their name, Malbec had lost its cool. It was no longer a grape that had anything unique to offer—save for that electric purple-blue color that gave me one more clue in a blind tasting—there was nothing more to that the Homerian dark-tinted rich fruit core. Not even Cahors, with an added benefit of earth, could help in resuscitating it. To be fair there were a few producers that made me pause when generalizing about Malbec, yet they would fill the glass so seldom they were like Halley’s comet in effect. It wasn’t that I was looking for the next hip thing either, but every time someone offered me a glass of Malbec it felt like a reminder that it should have been my last glass (…fool me twice, shame on me). Homogenized. Looking for inspiration, recently, I found an interesting bottle from Lo-Fi that had been discounted heavily by the retailer. Worth a gamble. Mike Roth’s Lo Fi project—it’s local—works similarly to those earnest Loire Valley projects of quasi-natural winemaking that can yield exceptional beauty. The aim of Lo Fi is to express a wine that showcases more grape than winemaking as they eschew additives and there is little to no manipulation in the cellar. I uncorked the wine, and began to analyze its appearance, which offered that peerless blue-ish purple in my Bordeaux stem. The aromatics were tilted to a darker set of fresh-picked berries, violets and there was a subtle earthy aroma… but otherwise the wine was unabashedly primary. On the palate the wine was more akin to one of my favorites at our restaurant—La Grange Tiphaine. That is to say, closer to a Loire Valley expression of Malbec (Cot, as it is known there), than the imitable Southern Hemisphere examples. Medium-bodied with great acidity and more freshness of fruit that followed the nose. The wine was perfectly suited for the Wednesday that I opened it. If you were looking for something big and concentrated then you should continue your search. But if you were looking for something that can genuinely bridge the gap between Old and New World Malbec, then this would be an apt selection. Fabled French labels, and classy, curved bottles may have written the script for rosé, but it’s a brave new world out there—some exceptional values still exist in unlikely places. I dug into the icebox and found a wine that was apt for the 105˚ day that I spent in the valley. Viña Apaltagua’s rosé of Carmenere (85% Carmenere and 15% Syrah) is of Chilean descent, specifically from the Maule Valley, and was new to me. A highly recommended value from a shopkeeper that I trust in Orange County, he had pitched the wine as a surprising find for himself. Unscrewing the cap, the wine was chilled to the forties and would open slowly as the hot, ambient air enveloped the bottle and poured glass. After a few minutes I nosed the salmon-hued wine, finding passion fruit, lime, strawberry and something faintly green, but pleasant like rubbed Geranium stems. In the mouth it was dry, red-fruited, with more strawberry and raspberry flavors upfront, with medium-plus intensity, the citrus and tropical accents found on the nose took a backseat. The rosé had refreshing acidity, medium weight from the lees aging—not as angular as I was expecting—and finished cleanly with a nice mélange of flavors. It was delicious and inexpensive (under twelve dollars). This wine wasn’t like analyzing a Shostakovich symphony; rather it was akin to Bach’s minuet in G, where it was pleasant and not without a little bit of surprise—perfectly cooling us down from the fiery atmospheric conditions outside. Given the circumstances I would have been happy with most dry rosés, but I was happy to have found such a tasty and affordable option from outside of Provence. Behind a few very exciting winemakers, South Africa was fast ascending my wine to-do list. 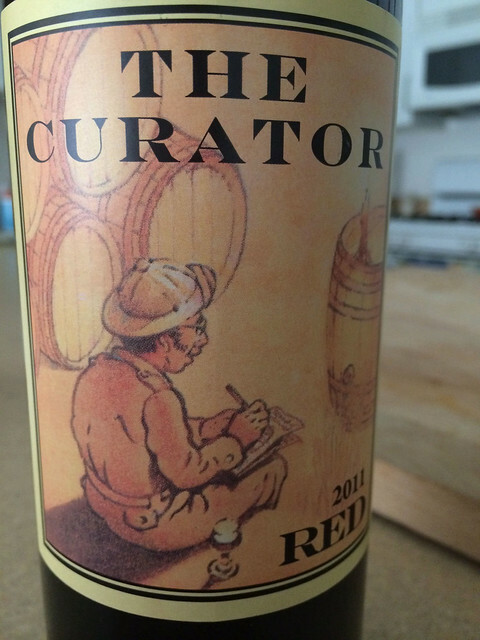 Starting from the ground up, last Sunday I had a bottle of A.A. Badenhorst’s “The Curator” red blend to get myself acquainted on the cheap. My background on the producer—A.A. Badenhorst—stemmed from my grocery buying days when I had purchased cases of “Secateurs,” red and white, to stock the shelves as a way to beef up my puny South African set. Based in Swartland, an area fifty miles north of Cape Town (in the greater wine region of the Western Cape), the Badenhorst family employs contracts with growers to purchase old-vine grapes to make eminently drinkable and affordable blends under “The Curator” title. Not one for Rhône-style white wines, I opted for a bottle of The 2011 Curator red while shopping in Huntington Beach. A rich garnet in the glass, painting my tulip—glass—with moderate tears and erupted with a core of dark fruit, smoke, meatiness and pepper that was true to its French inspiration on the bouquet. In the mouth it had medium weight and a nice texture (medium and round tannins), and a moderate finish that echoed its exuberant and developed fragrance with a bit more olive and twig. It fit the bill for the evening and paired well with the red meat that was served. 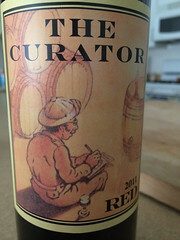 It is hard to find convincing wines under ten dollars, but “The Curator” red, a blend of Shiraz / Syrah (95% of the blend), Mourvedre, Cinsault and Viognier was seamless and over delivered. I loved every sip and was happy to taste such an unassuming wine that will hopefully springboard my own interest into a relatively unknown (speaking for myself again) territory. Back on the horse (pardon the cliché and my delay), 2015 begins with Altesse, a little known grape variety made famous in Savoie. 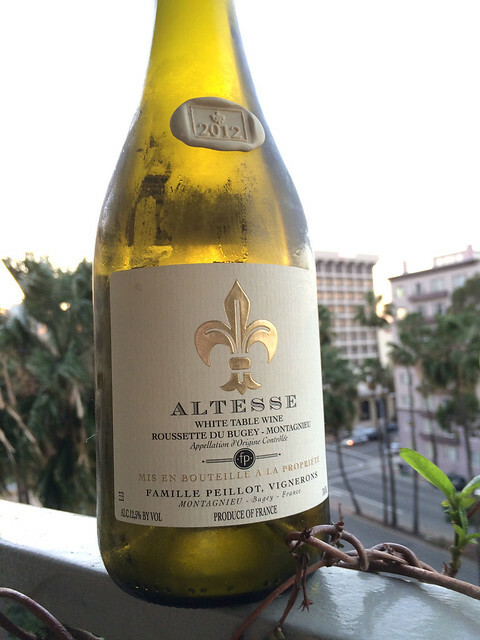 I was introduced to two separate examples at the beginning of the year, not thinking much of it, and now, sprouting like Daffodils in springtime, Altesse is routinely making appearances at top restaurant wine lists in Los Angeles. Inclined to delve elbow-deep so that I could better understand the buzz around the grape, I began my search for a bottle. Combing the aisles of K&L I procured a seven-fifty of 2012 Famille Peillot Roussette du Bugey—100% Altesse—for a decent sum (in the mid twenties). I took it home and chilled it down, in order to serve with a light a salad and some white fish, reading more about the producer and region to enrich the experience. I poured the wine and allowed it to stretch out from its bottled confines, while putting the finishing touches on the salad and allowing the fish to cool. It turned out that my decision to purchase a bottle of Famille Peillot, under the direction of Franck Peillot, was better than expected, since the family had a long and intimate history with the grape. Four generations of family tending vineyards in the Roussette de Bugey appellation on steep clay and limestone soils at the most southerly part of Jura mountain range (think east of Lyon for geography sake) were enough to see what the varietal had to offer. On the nose the wine offered little aromatics, but with a good sniff I managed to extract yellow plum, citrus, almond and minerals. The palate showed off one remarkable trait while the rest fell into the light-to-medium camp…rapier-like acidity (high acid). The wine was reminiscent of Picpoul or Muscadet but with a little less brightness. 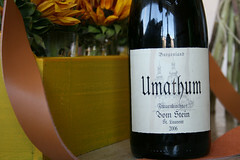 Tart plum, citrus and nuts were detectable on a medium finish but the wine was a great pairing for dinner. I liked the idea of the wine; although I wasn’t wowed, I could see it lending value and obscure notoriety to a wine list, a chance for discussion with an inquiring guest. I have to say that I liked the wine more after knowing the story about Franck and his hands-off approach to Altesse, allowing his wine to show off its terroir with little manipulation. I look forward to trying their Monduese next time, but will save that for another entry. Best wishes on the trail! What was a smart and mobile business plan ballooned into a full-fledge phenomenon in the late 2000’s. 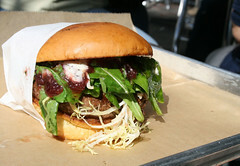 Every festival, event and abandoned parking lot seemed to offer gourmet options on wheels. Even now there are televised competitions and endless variations on interesting cuisine concepts launched. 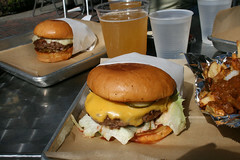 However exciting the menu and cool paint job though, the idea of waiting in crazy lines and eating in uncomfortable settings was never that appealing, except for one Heavy Metal themed burgerie—and the best part of the exception was, they had a brick and mortar location. 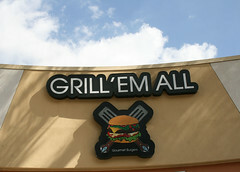 Headed to Alhambra, I looked forward to a belated birthday lunch with friends and an opportunity to finally try Grill ‘Em All. 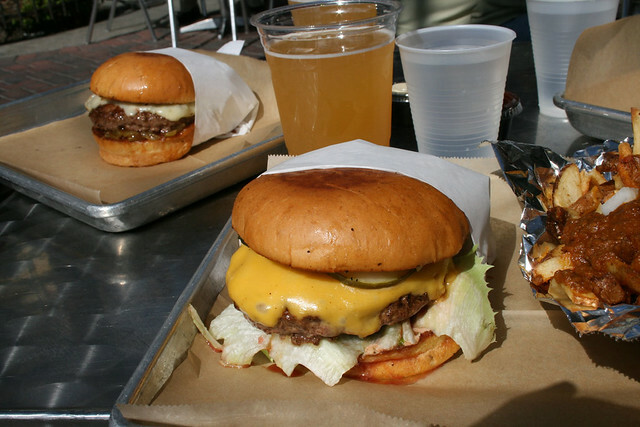 The roaming burger joint had made quite a name for itself, winning Food Network’s “Great American Food Truck Race,” and had settled in the gateway to San Gabriel Valley. With an edgier diner setting and an all-encompassing penchant for metal (music), the restaurant didn’t appeal to me much at face value. If it weren’t for the massive amounts of social media and tremendous word of mouth, I probably wouldn’t have paid them any mind—folk music was always more my thing. An extensive menu of scrawled music-laden choices didn’t speed things up, we measured our options; going wild for “Napalm Death” or “Powerslave,” would be reserved for a return visit as I held strong to my philosophy of judging the base, and ordered the “Winger” and accompanied it with “No More Mr. Nice Fries.” My friends went a hair more daring since they had been here before. It was apparent early on that their great reputation was earned by the endless procession of photogenic sandwiches trayed through a packed restaurant. By the time our food had arrived, I took a few snaps with the camera and we dug in. The Winger arrived gloriously with an unruly avalanche of American cheese and few edges of Iceberg lettuce protruding from the toasted brioche bun. An homage to the classic West Coast hamburger lathered in thousand-island dressing and bread-n-butter pickles to buttress the ridiculously tender patty. No head banging about it, the Winger was excellent, a lot of jus from the meat and a soft ‘n well-seasoned grind played against the cold, crisp vegetables. No More Mr. Nice Fries were outstanding too, with a true meat-lover’s chili dressed over the piping hot potatoes—one of the best chili fries I’ve ever eaten. Everything checked out at Grill ‘Em All; a bona fide concept on wheels brought the thunder to Alhambra and made this hamburger tracker very happy! Even though I had to make some compromises to my musical tastes—an ardent supporter of bluegrass and folk—for an afternoon, the result was well worth it. Maybe now I will feel more confident about the wait at their food truck. As a rule I try not to praise my own wines (that I sell) like spoiled children—the attachment to a brand or a story clouding my objectivity—by not paying enough attention to their individual faults and virtues. But there are a few wines, and producers, that are so compelling that I feel like I have to share the gospel—this is the closest I will get to proselytizing or picking a favorite child. 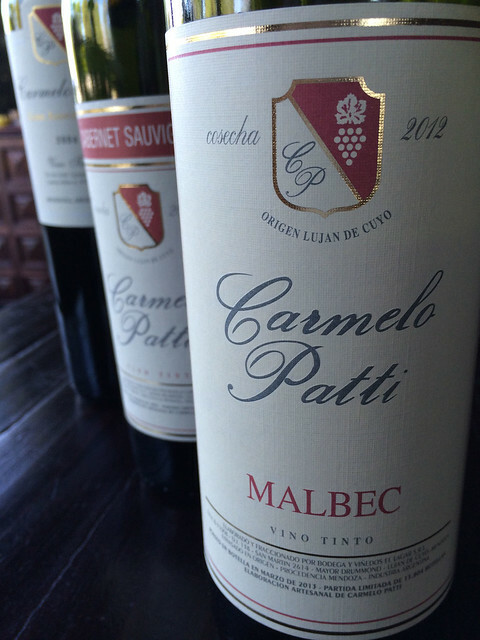 Before I started to sell Carmelo Patti’s wines, I knew of one producer pushing counter to the barrage that was being peddled to all buyers (myself included) from Argentina. I had been introduced to Bodegas Weinert, a traditional winery that had been described to me as the R. Lopez de Heredia of Argentina; Malbec, Cabenet Sauvignon and Merlot, among other grapes, fashioned in a masculine style, with immense structure, aged in large casks for extensive periods yielding wines that were savory and could only be thought of with food, unlike the more ubiquitous run-and-gun style offerings. As exciting as these wines were to me, the problem was I could never find them; buyers wouldn’t support Bodegas Weinert consistently, claiming that they were too difficult to sell. Carmelo Patti is an even smaller operation than the legendary Bodegas Weinert, crafting a fraction of the production nearly singlehandedly. A garagiste. A lot of care in the vineyard sites—Luján de Cuyo—and unmanipulated winemaking, with native yeast fermentation, delicate punch-downs and employing nearly all used French oak to keep the wines pure and honest. 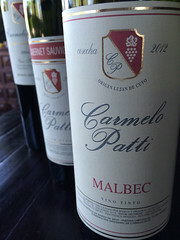 Much like Weinert, Patti will release his wines when ready and the 2005 Cabernet Sauvignon embodied this methodology perfectly. I opened the bottle for customers, booking appointments for two days to show the wines to accounts I thought would be interested. 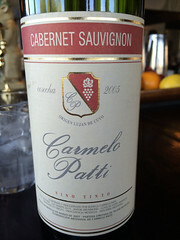 I was surprised that a few accounts didn’t open their doors to Carmelo Patti (his wines) because the overall showing was stunning—all were snatched up… we are plumb out. That was their loss! After the end of the second day I took the dregs of the Cabernet Sauvignon for myself and meditated on it privately to further assess what I had: Conjuring Old-World images, medium ruby in the stem, with dusty red raspberry, spearmint, dried tobacco leaves and olives on the nose. It was a deep scent that had no end. On the palate the wine was lithe, a graceful medium-body, contoured by medium-plus acidity and fine tannins that tasted of red raspberry, pomegranate seeds, Earl Grey tea, dashes of cupboard spice (of the savory variety) and pepper. It was elegant and complex; the transparency of the wine was seamless and soulful. In comparison to Weinert’s wines, they had a softness about them on the tongue. 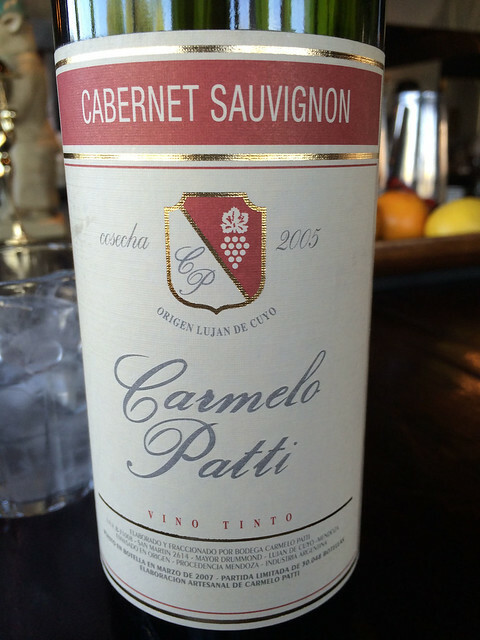 Patti’s 2005 Cabernet Sauvignon is reminder of why I sell wine, exposing others to a producer that is making wines in his modest style—humbly—ignoring the homogenized exports that flood retailers and grocery stores, thereby storming the public’s palate. Every wine has its place and Carmelo Patti and Bodegas Weinert certainly have one in my cellar!